Regular Quests: Stuffing, Stuffing/Cranberry Chutney, and Turkey (5 of each). Pass one of each dish while at a Bountiful Table. You can do this at most major cities by just sitting down and passing the food. While sitting at a Bountiful table pass the food around to other players. Eventually, you’ll randomly miss and hit someone in the head with the food. Acquire the “Spirit of Sharing!” buff at a Bountiful Table in each of your faction’s main cities. All you need to do is sit down and eat until you are full of each food available. Visit each of the opposite faction’s major cities and sit down at their Bountiful Tables while wearing the Pilgrim’s Hat and one of the Pilgrim chest pieces (Dress, Robe, or Attire.) The tables are located outside of the cities, so you just have to get to them and have a seat. This might be difficult for lower level players. You will need to buy a Bountiful Cookbook from any Pilgrim’s Bounty Vendor for 1 silver in order to complete this part. You will then need to cook each of the Pilgrim’s Bounty recipes. Using only the five recipes contained in this cookbook during Pilgrim’s Bounty you can level from 1 to 430 cooking skill. Here’s a pic of a level 3 alt with 429 skill. The Slow-Roasted Turkey recipe will go grey around 360 or so. Keep cooking! You will get skill-ups even though the recipe is grey. 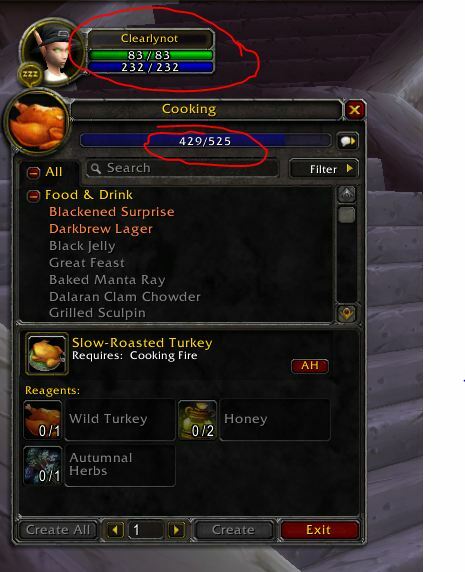 Actually, you get +2 skill for each turkey until 400+, 1 per turkey till 410 or so, then it starts slowing down. It’s really slow after 425. There is no level requirement for cooking. This 429 skill is on a level 3 Warlock. Look at the HP. To get this one you will need to kill 40 Wild Turkeys with less than 30 seconds between each kill. You will know you’ve completed this when you get “Turkey Triumph.” You can find these Wild Turkeys in Elwynn Forest and Tirisfal Glades. This one can be difficult to get if many people on your server are also in the area attempting to complete this quest. It may help to make a macro to target the turkeys and place a raid icon over them, making them easier to find. For this you’ll need 8 turkey blasters from the daily quests which you will use to blast 8 Rogues, one Rogue from each race.